Part of me wants to leap up and down while flailing my arms and twirling in the street and scream 'welcome fall, you are my favorite season in the whole wide year of seasons..... can you stay forever?'. It would be like one of those epic moments in an 80's film. Then I remember I live in New York, and such antics would classify me as the 'resident crazy' to the neighbors.... and well, we don't want that to happen. Still trying to get them to not judge us for the eight million times our smoke alarm goes off because I can't cook. If you're one of our neighbors and somehow drifted to the end of the internet and found this post.... sorry, I'm learning. I swear. I'll just admit now, this won't be the last time you hear me preach about my love for fall. This is just the first for the season. The air here in Brooklyn has an added crispness, the leaves are slowly, but surely, changing a few shades and the sun is setting an hour earlier. My mood has drastically changed now that I'm not worrying about what outfit to put together that I won't be dying of heat in and, let's face the facts, layering just makes my day! 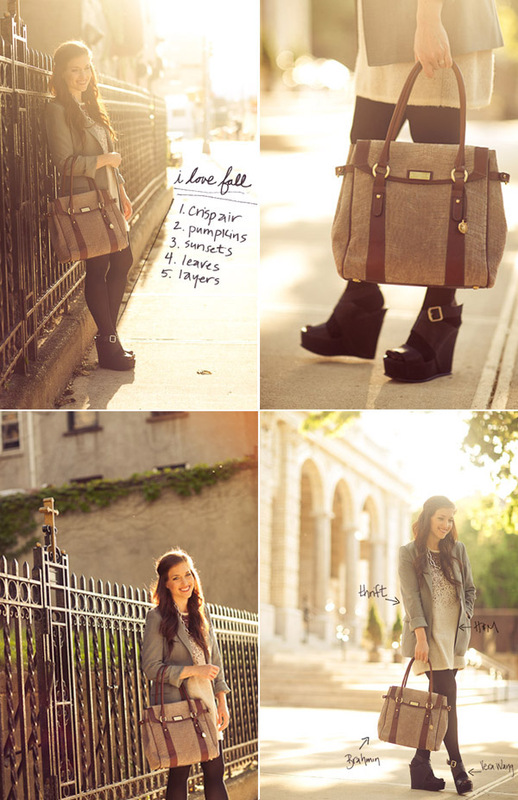 For me, with a new season comes new fashion and a great time to start re-thinking your wardrobe. When Brahmin asked if I'd put some outfits together to pair with their new fall 2012 collection, I was inspired to start early on my fall mixing and matching. Plus, I do love me some sparkly new handbags...... even if they were sent on loan! But, I'll let you in a little tid-bit..... it's not easy trying to style a fall campaign shoot in May when it's nearly 90 degrees outside and you're trying to channel the smell of a fireplace, crips autumn air and Thanksgiving feasts. Man, that sweater dress was h-o-t like an oven. I also don't recommend prancing around the streets of Brooklyn in a full-on leather skirt while it feels like the Sahara desert outside either. With great sacrifce like that comes great rewards for you..... my readers. 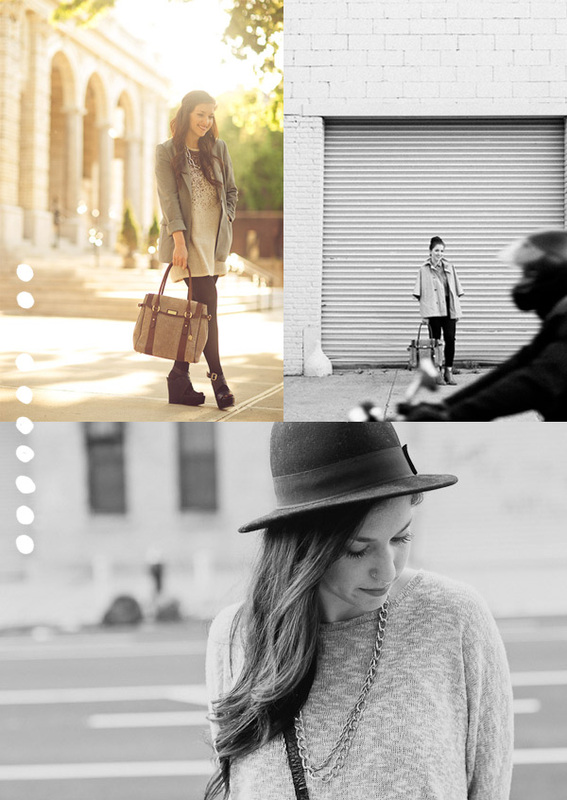 I wanted to let you all in on a few sneak peek shots we did for the fall campaign. 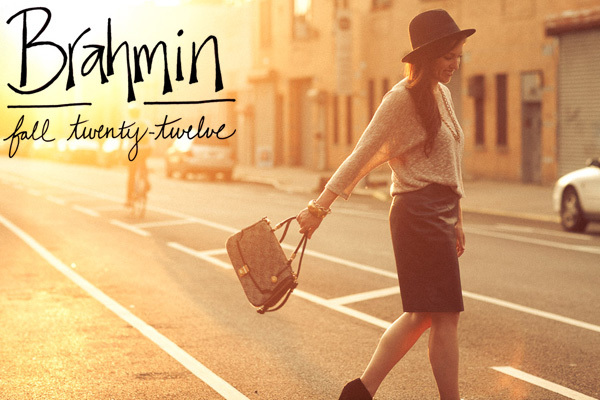 Check out Brahmin's entire (and I mean, it's huge) selection of fall handbags. I'm thrilled to be in the company of some veryfashionablefellowbloggers, so be sure to check out their looks as well. Everyone did a great job of adding their own personal touch to each photo and styling! The full catalog/campaign is going to be released later this month, so I'll keep you updated when to check it out. And do share, which fall Brahmin bag is your favorite?